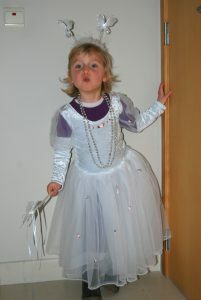 Girls LOVE to dress up as princesses. How do you make the best and prettiest princess costumes for kids? What does she all need? Let’s look into what different items are needed to make the “perfect princess outfit” for dress up play, Halloween, a pageant, or a Princess theme party! THE PRINCESS GOWN – THE OBVIOUS: First off, while it’s fun to dress up in Mom’s old bridesmaid gowns and feel like you’re a grown up Princess, having a few princess costumes for kids that actually FIT properly (or close to it) is seriously awesome. There’s nothing quite like that look on your little girl’s face, is there, when she’s decked out in her favorite princess gown that’s HER size, a tiara, and princess shoes, ready to take on the world as the prettiest Princess there ever was. So the gown is the first and most important element of the perfect princess costume, but there are other pieces that you need to have as well. What are they? 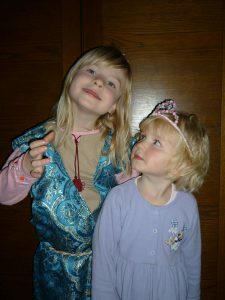 Princess Costumes For Kids: What’s Needed For the Full Princess Get-Up? Other Accessories: Sceptres, Scarves, etc. However, when buying second hand, while shoes can be in top shape, more often than not the gowns are frayed or have holes in the mesh arms, have food stains on them, or just don’t look so lovely anymore. And to properly play “princess”, your daughter needs to feel like she’s as beautiful as Rapunzel, Cinderella, Belle, and the others. My advice would be to splurge on one or two gorgeous new gowns (they aren’t all that pricey, thankfully). I’d also advise that if the situation warrants it (not a birthday gift, for example), have your daughter help with the selection process. That way you’ll know she’ll love it… and you’ll get your money’s worth. (Or, if you KNOW she adores a certain Disney princess, or has a favorite color, get that one for her birthday). Here are some adorable and best selling princess gowns for little girls that you can’t go wrong with purchasing, if the dress is a surprise. 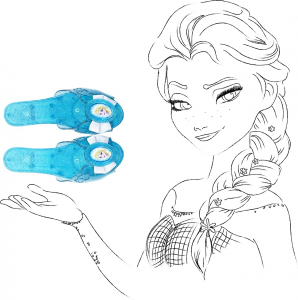 If your little girl loves Disney’s Frozen, check out my page completely dedicated to Frozen Dress Up Shoes – there are over 30 options!! Princess Jewelry makes for great gifts or party favors, especially sets of matching clip-on earrings, necklaces, and bracelets (and tiaras often). Girls love to pop on their pretty “jewels” as well as just finger them and enjoy their beauty. There are many popular gift sets for Princess Jewelry for little girls – popular because of their great reviews, good value for the money, and well liked by girls who receive them for gifts, etc. 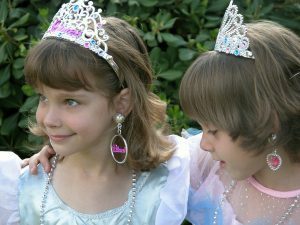 Although not necessary for princess costumes for kids, other princess accessories do go a long way towards achieving that perfect princess feel. 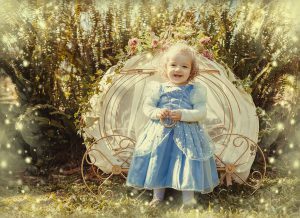 If you are looking to add some princess costumes for kids to the dress up box of a girl you know, you’ll be making her day! I’d love to hear from you and see pics of your pretty princesses – please comment below! What part of the princess costume get-up is YOUR girl’s must-have? 20 World Book Day Kids Costumes: Which One Is Perfect For YOUR Child? What a great article. My daughter is huge in to dress-up, but I’ve never really fully comprehended what accessories she required. Maybe because I didn’t play dress-up as a kid? Tiaras and Jewelry are two things she doesn’t rally have yet. I thin I’ll take your advice to look a little more in to these. And pets?! She would love some sort of pet. What would you recommend I look in to? Don’t worry too much if you don’t have all of the “recommended” items for your daughter all at once. I’m sure your daughter’s Princess Play will be just as fun and cute without the tiaras and jewelry for now. But yes, she’ll look adorable in some “jewels”, no doubt! I used to love dressing like a princess when I was small. I used to use my Mums evening dresses and high heels and prance around the house. My gran also donated some of her old dresses, so I eventually had a whole suitcase full of clothes that we didn’t spend a penny on. Nowadays, of course, there is just so much available that we never had. I would have loved to own one of those beautiful ones you show in this post. Thanks for commenting, and have a lovely day! This is just what I needed. I have four little girls and they are coming around the age where they are wanting to dress up and be characters they see on things they watch. Thanks to this post I now can go to my man cave and make some decent princess costumes.